Gar Alperovitz has had a distinguished career as a historian, political economist, activist, writer, and government official. He is currently the Lionel R. Bauman Professor of Political Economy at the University of Maryland and is a former Fellow of Kings College, Cambridge University; Harvard's Institute of Politics; the Institute for Policy Studies; and a Guest Scholar at the Brookings Institution. He is the author of critically acclaimed books on the atomic bomb and atomic diplomacy and his articles have appeared in the New York Times, the Washington Post, The Los Angeles Times, the New Republic, The Nation, and the Atlantic among other popular and academic publications. Alperovitz received a bachelor of science degree from the University of Wisconsin; a masters degree from the University of California at Berkeley; and his Ph.D. in political economy as a Marshall Scholar at Cambridge University. After completing his studies he served as a legislative director in both houses of Congress and as a special assistant in the State Department. Among his many achievements is having been the architect of the first modern steel industry attempt at worker ownership in Youngstown, Ohio. In addition, he was nominated to be a member of the Council of Economic Advisers by leading national consumer, labor, and environmental organizations. He is also the president of the National Center for Economic and Security Alternatives and is a founding principal of the University of Maryland-based Democracy Collaborative, a research institution developing practical, policy-focused, and systematic paths towards ecologically sustainable, community-oriented change and the democratization of wealth. Visit him at www.garalperovitz.com. "Accessible and honest, Gar Alperovitz's new film is important viewing. 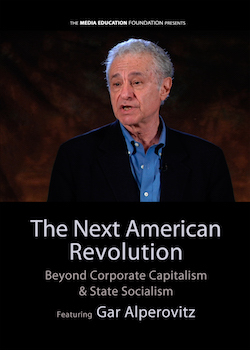 As he has done in his books, Alperovitz calls for a new economy and shares a brilliant strategy for the type of transformative change that can lead America from decline to rebirth. An enormous contribution exactly where it is most needed." "The 2008-09 Wall Street collapse and Great Recession exposed the severe long-term problems facing U.S. capitalism, including mass unemployment, rising inequality, and environmental destruction. Gar Alperovitz excavates the root causes of these problems in this brilliantly clear lecture. But he also goes much further, to provide solutions that are equal parts practical and visionary. Alperovitz develops nothing less than a program for deep democratic renewal in the U.S., building from a wide range of exciting work already being done by people throughout the country." "Economic historian Gar Alperovitz looks at the quiet growth of employee-owned companies (which now have 10 million members), the 130 million members of co-ops and credit unions, and sees the potential to democratize decision-making. From Cleveland, Ohio to Atlanta, Georgia to Amarillo, Texas, he catalogues how these new forms of ownership succeed economically. Always thought-provoking, Alperovitz suggests that America's pragmatism, strong local traditions, and 'can-do' attitude may help pull us out of our current political and economic stalemate --- even in areas where we have lagged behind. Out of its troubles, America has the capacity to birth an evolutionary re-construction of capitalism. That reconstruction could have a more human face and a more realistic approach to environmental challenges such as climate change. So if you have given up on the possibility of positive change... watch this video!" "Gar Alperovitz does more than pack a tremendous amount of passion and wisdom about the structural ills of our society. He proposes a common-sense strategy for fixing them as well -- grounded in local institutions that can construct a truly democratic economy. Every progressive should watch this video and then start practicing what this economist preaches." "In this refreshing and illuminating film, Gar Alperowitz discusses the practical alternatives to capitalism and state socialism which already exist in the activities of grassroots organisations across the U.S. Although he stresses that we need to be cool and cautious about the likelihood of a post-capitalist system coming to fruition, Alperowitz deftly avoids the traps of pessimism in the face of a stagnant and seemingly unchangeable system and of optimism rooted in a naivety about the paths to a democratic, egalitarian future. This film is recommended to people of many political persuasions, who are disillusioned with the current system and open to suggestions regarding how to transform it." "Gar Alperovitz challenges us to think systematically about our current environment, and make connections between the myriad of innovative alternatives arising from the pain of crisis, stagnation and decay. He offers an analysis that brings together disparate trends, both positive and negative, as he builds an argument of hope for democratic ownership and a just society." "Alperovitz leads a grim tour of the deteriorated values at the core of the American experience -- equality, liberty, democracy, and the wise use of our collective wealth. Then he takes us to the mountaintop with a broad and optimistic mapping vision of how Americans can remake their economy and society to restore those values. A compelling and convincing story of the future." "If you want realistic hope, watch this film!" "With an iron-clad logic and at a graciously temperate pace, Gar Alperovitz charts the road from the recent social discont to a new socio-economic system, without passing through utopia. Instead, he discerns the attainable possibilities for a better life in what already exists as small-scale economic and social experimentation in the United States -- experimentation driven equally by people's desperation and that inspired commonse-sense, that forward-looking pragmatism that has given American society the optimistic, roll-up-your-sleeve spirit that has enabled its best achievements. The informative academic content, combined with ideas that tease the intellectual imagination, make this film a valuable teaching tool."